Thank you for visiting SmallGovCon! Please browse the site, comment on posts of interest, and feel free to contact me if you have questions about anything posted. SmallGovCon is a blog providing legal news, notes and commentary of interest to small government contractors. 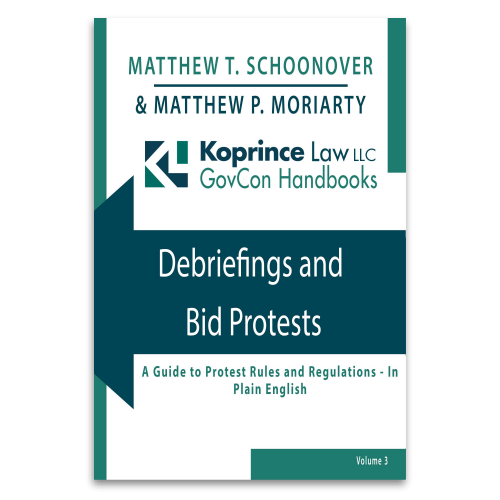 Primary coverage includes the size appeal decisions of the U.S. Small Business Administration’s Office of Hearings and Appeals (known as SBA OHA) and the U.S. Government Accountability Office’s bid protest decisions. In addition, SmallGovCon covers legislative developments, administrative matters (such as fines levied on “bad boy” contractors) and federal court decisions. If you have ever taken the time to browse a legal blog before, you may have been put off by legal jargon, citations, and indecipherable sentences. Not here. At SmallGovCon, we write in “plain English.” You don’t need a law degree, or your high school Latin, to read our blog. Does SmallGovCon Cover all SBA OHA and GAO Decisions? No. Although we write about many SBA OHA size appeal decisions and GAO bid protest decisions, we do not cover them all. Instead, we pick and choose which ones to cover, based on what we think will be of most interest to readers. We may cover a decision because it illustrates an important point of law or because it signals a change in existing law, for instance. On the other hand, we may ignore a highly-contested case because it does not cover any new ground. If your favorite SBA or GAO decision (and who doesn’t have one?) was left out, you can always contact us to suggest that we cover it. How Can I Find Relevant Posts? Like most blogs, SmallGovCon is organized in reverse chronological order, with the most recent posts appearing first. However, if you’re only interested in our posts on the service-disabled veteran-owned small business program, for example, you can use the site’s handy search function to find them. What was Koprince Law’s Role in these Cases? In almost every case: none. 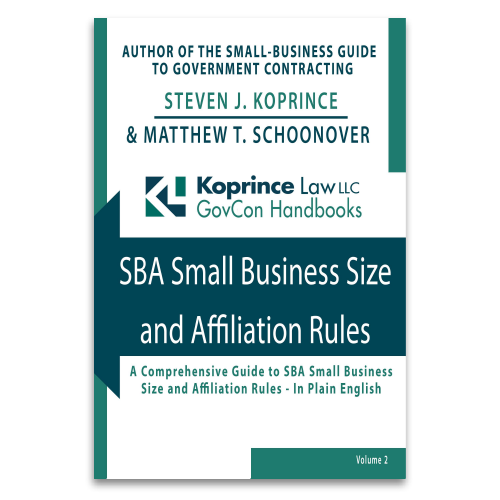 SmallGovCon is published by the federal government contracts lawyers at Koprince Law LLC. And at Koprince Law, we take client confidentiality very seriously. In order to ensure that we never inadvertently breach a client’s confidence, we ordinarily do not blog about the cases in which we participated. We make exceptions only in extremely rare situations, where one of our cases is of special interest to the broader contracting community. And even then, we blog about our own cases only with the client’s permission. In the very unusual situation where we blog about our own case, this will be specifically noted in the post. Please do not contact us to ask whether we have special, “behind-the-scenes” knowledge of the cases we blog about. We don’t (or, if it’s our own case, our ethics rules prohibit us from releasing such information). In almost every post, we link to the source material, such as a GAO bid protest decision, a new federal regulation, or a Department of Justice press release. If you read the source material, you will know as much as we do about the underlying matter. Can I Write for SmallGovCon? If you have something interesting to say about government contracts, feel free to contact me to discuss the possibility of a guest post. Yes, your name, company name, and contact information will be displayed with your guest post, allowing readers to reach out directly to you. No, we will not accept your post if it consists of blatant marketing, rather than government contracts news or commentary. Additionally, we will not accept your post if it is off-topic, that is, if it deals with any subject other than federal government contracts law. Why Haven’t You Answered My Legal Question? SmallGovCon is designed to provide educational legal news and commentary to the small government contracting community. Although we hope that the posts will lead to comment and discussion, we do not provide answers to specific legal questions for non-clients–including “follow up” on topics discussed on the blog. If you are interested in becoming a client of our firm, please contact me. Why Haven’t You Posted My Rumor? At SmallGovCon, we summarize official, published decisions and releases, such as GAO bid protest decisions and Department of Justice press releases. We do not publish rumors or innuendo. If you believe that someone or something is abusing the government contracting system, and should be investigated, you should contact the appropriate government authorities–not us.